I love Arduinos as much as the next (nerdy) guy, but let’s face it, they are no powerhouses (DUE and ZERO excluded, but they discontinued the former.. go figure..). The Atmel AVR series is 8-bit and its clock is ridiculously slow by today’s standards. Sure, you can get it to do some things with impressive speed if you are willing to do some low-level programming but I myself do this as a hobby and thus don’t really want to deal with assembly-level code. If only there was a fast and cheap microcontroller that was easy to program.. Enter the ST STM32F103C family of microcontrollers. Friggin’ fast. 32bit ARM architecture running at 72MHz. Very well equipped in the I/O department.. 2 x UARTs, 2 x SPI busses, 2 x I2C ports, etc. Dirt cheap. 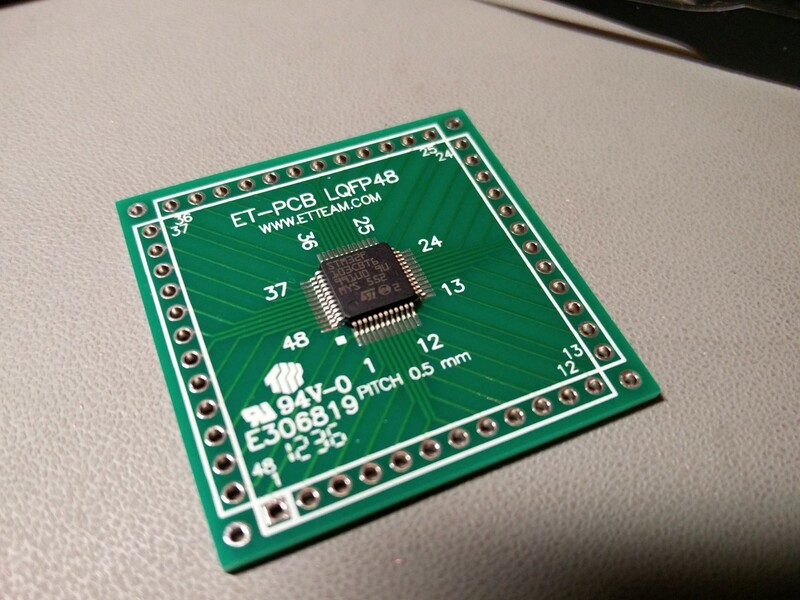 You can get an Arduino Nano – sized board for less than 3€ shipped. It’s pretty easy to get started using these microcontrollers. All you have to do is buy a tiny board from Ebay. You will also need a USB to Serial adapter that works with 3.3V voltage levels (you probably already have one of those lying around already..). These tiny boards are known as “Blue Pills” or “Red Pills”, according to the colour of the PCB. There are other variations as well, but the red and blue variants are the most commonplace. They have relatively minor differences. 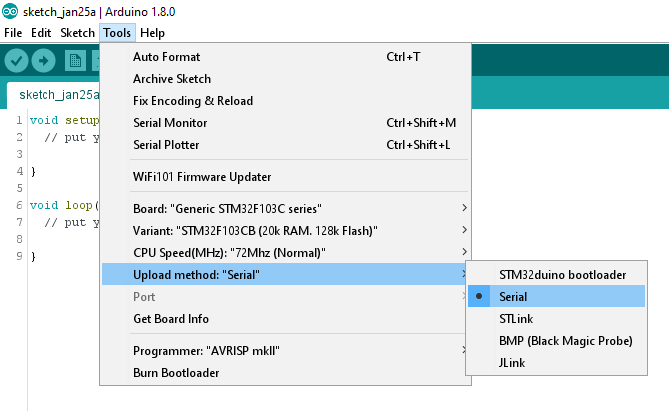 To get started, you have to connect your USB to serial port adapter to the STM32’s RX1, TX1 and GND pins. RX from USB adapter goes to TX1 (PA9 pin) and TX goes to RX1 (PA10 pin). At the time of this posting, IDE 1.8.0 (latest available edition) is properly supported. You will also need to install support for the Arduino DUE or ZERO from the Boards Manager, otherwise you will get a “/bin/arm-none-eabi-g++: no such file or directory” error. You are now ready to try your first code upload. // initialize digital pin PC13 as an output. In case of the STM32 uCs, the only necessary modification is changing the pin number of the LED to one compatible with the Blue (or Red) Pill (PC13). Pin numbers for this family of uCs are not just numbers like they are for the Arduino boards (like 1,2,3….,A1,A2,…) but are named as they are described in the uC’s datasheet (PC13, PC14, etc.). The procedure for uploading code is a little different than the one for the Arduinos. The STM32s come with 2 built-in bootloaders. One of them boots from system memory and the other from program memory. These different bootloaders are selected by changing the position of the BOOT0 jumper. You set it to 1 to boot from system memory or to 0 to boot from program memory. Set ‘BOOT0‘ to 1. This way we will boot from system memory which contains a UART to flash uploader. In the Arduino IDE, choose ‘Upload‘. On the board, the blue LED will start to flash. After the upload is completed, our sketch will start. We should see the blinking LED. If we want our uploaded sketch to boot automatically after the next power-on/reset, we need to set ‘BOOT0‘ back to 0 (so that on next powerup we will boot from program memory). That’s pretty much it. 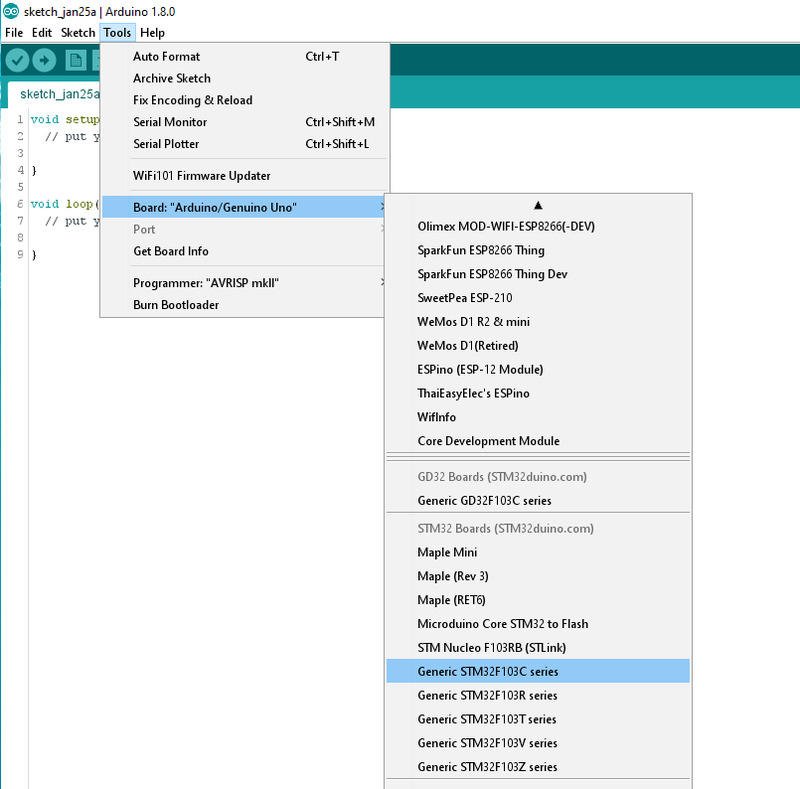 Your next step should be to go to STM32duino’s forum and check out the libraries that have already been ported to the STM32duino environment. If your sketch fails to compile, giving you a “/bin/arm-none-eabi-g++: no such file or directory” error, make sure that you have installed support for the Arduino DUE or ZERO from the Boards Manager. If you get an error on the IDE that it “Failed to erase memory”, that means that your STM32 chip is locked. 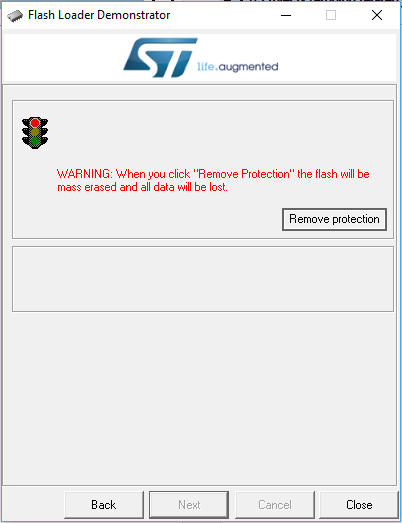 No worries, all you have to do is go here and get ST’s Flash Loader Demonstrator utility. It will unlock the chip with minimum effort. Be sure to run it as Administrator in Windows. 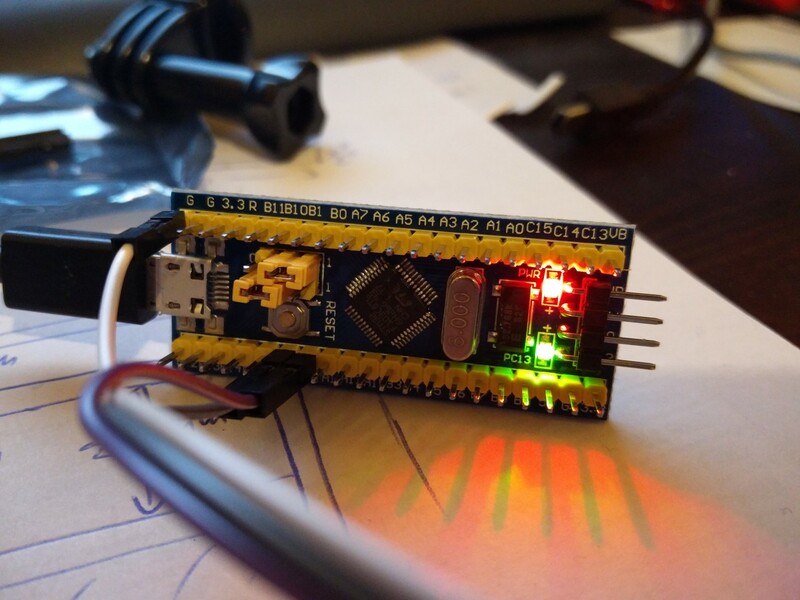 This entry was posted in Arduino and tagged Arduino, STM32 by Dimdim. Bookmark the permalink. Evolution!! Thanks (again), Dimitris, been looking for something with enough I/O pins to accommodate a 23-step TVC. Haven’t looked at the ported libraries yet but does it support the 0.96″ OLEDs? Says it does. Good. Shall try one or two – at that price it’s a no-brainer. Do you use the ST VLINK programmer? And have you successfully ported any of your sketches – like the ARDAM lite? I actually bought an ST programmer, just to be on the safe side, but the beauty of this thing is that in practice you never need to use a special programmer. I just upload through the serial port. For now I have prototyped an STM32 custom board with an isolated I2C port for use with chips that talk I2C. It has a built-in SPI LCD connector but that’s pretty much it. I designed it in a couple of hours, just to see if it would work. It does and surprisingly well. I’ll do a post about it..
Porting ArDAM Lite should be pretty easy.